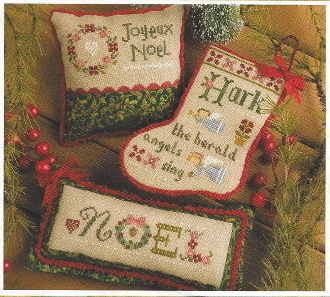 Three really cute Christmas cross stitch designs. Chartpak includes embellishments for all 3 projects. Approximate Design sizes: Joyeux Noel 4" x 2", Noel 5.5" x 1.5" and Hark 4" x 5.5". Instructions given for Weeks Dye Works threads with conversions given for DMC embroidery threads (not included). Models stitched 2 over 2 on 30 count Natural Linen (not included).